A stereo power amplifier with wide-open dynamic delivery, powerful low-end response and road-tested reliability—the Fryette Two/Ninety/Two Stereo Power Master-Built Amplifier has proven itself to be the standard for tube power performance, not only in its own size and class, but against many power amplifiers boasting considerably higher output power. Tonally, the Fryette Two/Ninety/Two combines the rich upper harmonic detail of a classic EL34 amp with the clarity and lower midrange punch of a 6L6. In Low Power Mode, the Two/Ninety/Two delivers 60 effortless watts per channel into a 4, 8 or 16 ohm load. Using Low Power Mode allows for maximum power amp saturation with a low fan-speed setting, ideal for studio recording where silent fan operation is essential. No other power amplifier available offers as much harmonic balance, wide open-dynamic delivery and powerful bottom-end response. 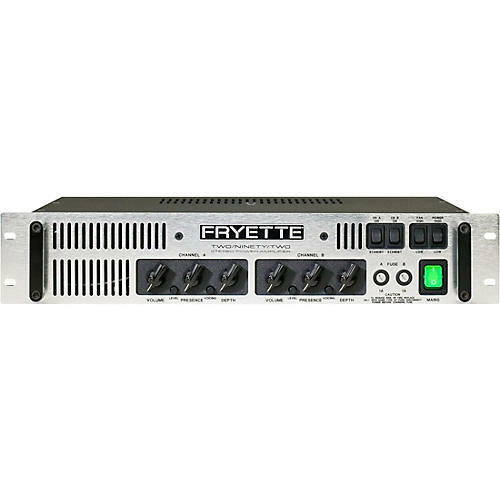 For 30 years, Fryette power amplifiers have set the standard for sound quality, power and rugged reliability. The designs are straightforward and functional, the build quality is unmatched, and long-term roadworthiness is amply attested to by legions of touring bands that depend on them. With their Depth and Presence controls, Input Level and Voicing switches and switchable power modes, there's simply nothing comparable to these amazing pieces of pro-quality gear.